ITV is opening up the archives of Children's ITV for one weekend in January with a special schedule of classic children's programming to mark the 30th anniversary of CITV. During the weekend of the 5th and 6th January, the CITV channel will screen classic children's shows from the 80s, 90s and 00s. 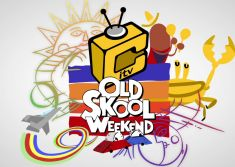 The channel is marketing the weekend of classic programmes as "CITV Old Skool Weekend"
Early schedules for the channel indicate that classic programmes will include Super Gran, Knightmare, T Bag, Press Gang, Art Attack, Dangermouse and Fraggle Rock. Press Gang famously launched the careers of Julia Sawalha (Absolutely Fabulous), Dexter Fletcher (Lock, Stock and Two Smoking Barrels, Hotel Babylon) and Lucy Benjamin (EastEnders) and was written by a certain Steven Moffat (Doctor Who, Sherlock). ITV has confirmed that the programmes will be available on ITV Player, with further episodes of the featured children's programmes available to rent and view via the online portal. CITV - originally branded as "Children's ITV" - launched as a network wide strand of programming in 1983 and featured live continuity from Central ITV's studios in Birmingham. Until 2006, children's programming aired during the late afternoon on ITV, before most children's programming on ITV was moved solely to the newly created CITV digital TV channel. In the late 80s through into the early 90s, This Morning took a summer break and was replaced by Children's ITV Summer Mornings for the school holidays. As part of the 30th anniversary, a special programme will be broadcast on ITV1 where former CITV presenters including Ant and Dec, Fearne Cotton and Holly Willoughby look back on the the shows that gave them their breaks on to TV. 30 years of CITV, Saturday 29th December, ITV1 6:30pm.